I don’t think anyone disagrees that it is necessary to teach children their phone number. We all know how important this is in an emergency! Not only is it a great life skill to do, but it is also important for kindergarten readiness. The hard part is getting it to stick! Especially for younger children who even have a hard time just remembering their age. I’ve taught preschoolers their phone numbers for years, and the truth is that a month later, almost everyone has forgotten it. And it’s understandable! Back when I was younger, I only had seven numbers to memorize. My own children have to memorize 10 now. 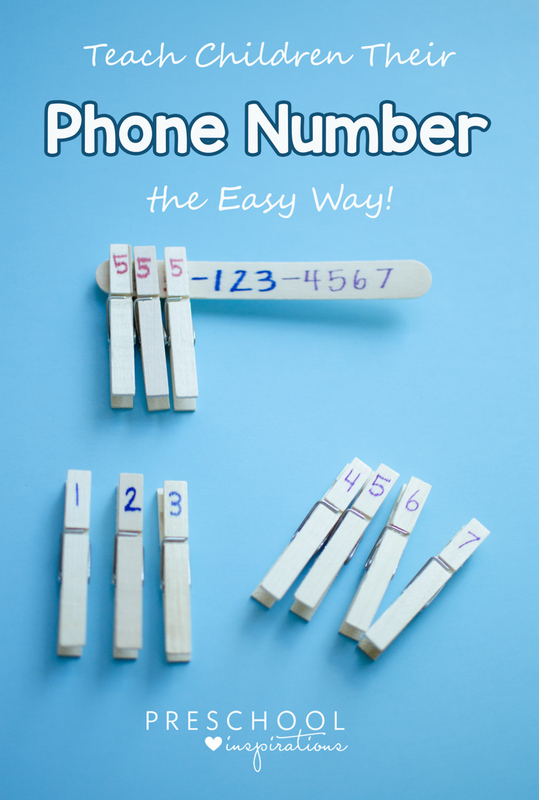 After struggling to teach my own children to remember their telephone number, I have finally found a method that worked! 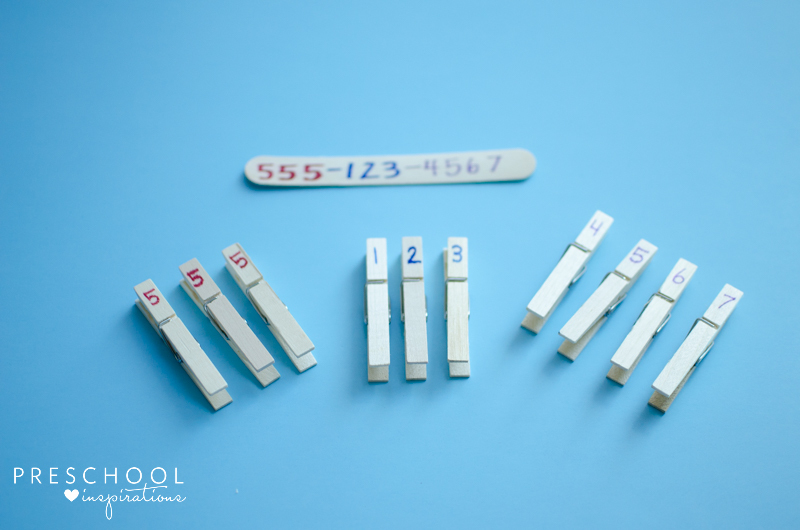 This hands-on activity is super simple to put together, and my kids had their telephone number mastered in a day. I am including a video of how to use this at the bottom of the post! I love that children are also working on fine motor skills as well as important math skills at the same time. I typically find clothespins, craft sticks, and permanent markers at the craft store. But they are also available online. Just click any of the links above. We used an Ikea storage box, but even a simple plastic bag will work to hold everything together too. Space out all of the blank clothespins needed and place them on the blank craft stick. Make sure to consider where the hyphens go. Then choose three colored permanent markers to write the phone number. Dividing the phone number into colored sections is a proven way to help increase a child’s memory (and an adult’s too!). Make sure not to do a pattern of ABC-ABC-ABCA with the numbers. That can be confusing. Instead, it needs to be AAA-BBB-CCCC. 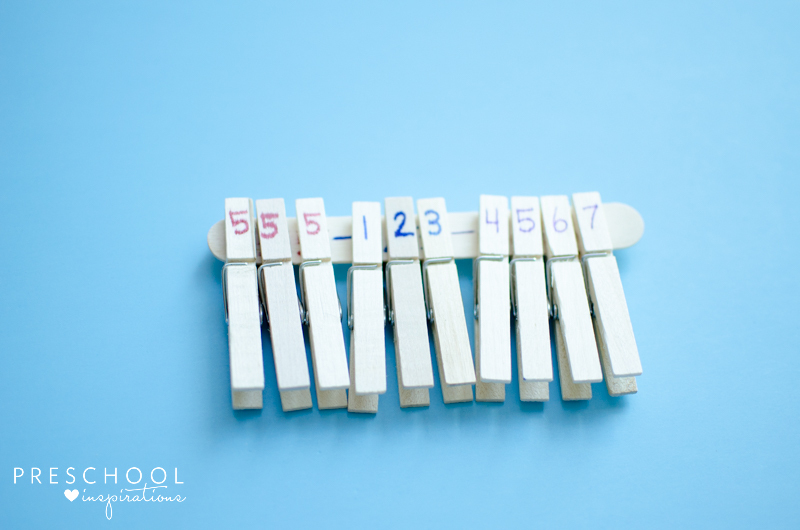 Remove one clothespin at a time, and write each number onto the craft stick. Make sure to switch colors at the right time. Once all of the numbers have been written on the craft stick, then write them on the clothespins too. And match the colors for each section. Now when you pass it off to the child, it’s super easy! Place the clothespins in a designated area, along with craft stick. Have the child sort the clothespins by color first. Then the child will match the numbers to the correct categories. Demonstrate to the child how to do the activity, and then have them repeat it! Here’s a video of how that looks! When it’s all done, just store it in a box or plastic bag. After we had put it away for about a month, I quizzed my children on our phone number. One of the two got it right away, and my other child was only one number off. I sung our phone number and address to the tune of Camptown Races when my kids were little. I made sure to start with the phone number then sang: ” The area code is —“. Also made sure that they had the zip code included for our address. Worked like a charm. I love that song! What a great way to work on it :).